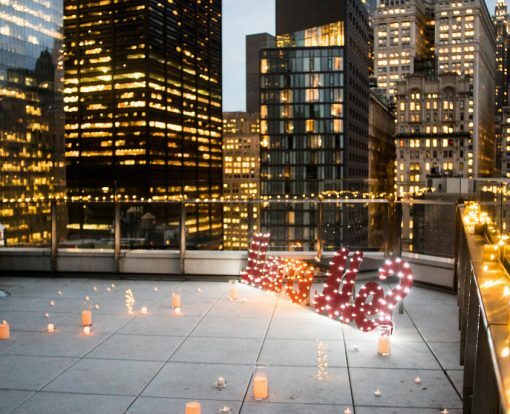 Valentines Day is just a couple day away, so we decided to share with you some love tips on how to pop the question on a rooftop on that special day. It’s not a secret, girls expect a special present on this day, so you really need to play it right on V Day. Luckily, it’s also a fashion week in New York on those days, so you can use it as a cover. Tell her that there were this “free tickets to the runaway” at your work and if she wants to go you can get them. We promise she will say ” yes” to that offer. When you will arrive at the “fashion show” the front desk person will suggest you to check the terrace view and that’s where the magic will happen. Candles and Empire State Building will be at its beauty as you get on one knee and declare your love. Yes, she will expect you to book a nice restaurant and have a romantic dinner. So why ruin the expectations? Tell her week ahead that you got a table at that nice restaurant so that she won’t have any plans for that evening. Bring her to the rooftop, where the heart of the rose will be waiting for her. Get on one knee inside the heart and pop the bottle with the best view you can ask. ” Yes” guaranteed. Send her flowers to work with the love note and the address. When she will arrive, the elevator doors will open right on a rooftop, where candles and rose petals will make the path to you. Your love song will be playing and you ask her hand. Surprise guaranteed. 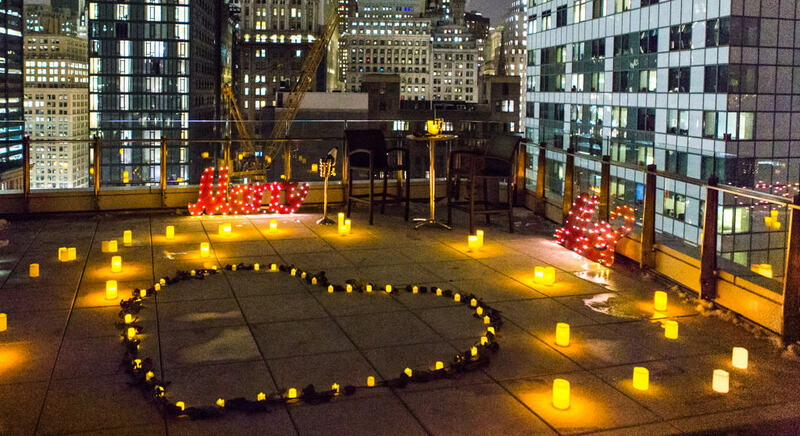 Plan ahead a Valentines Day party at your place, let the guests and family members came in and somewhere in the middle of the party suggest to go all together to check your rooftop as you have a great view. 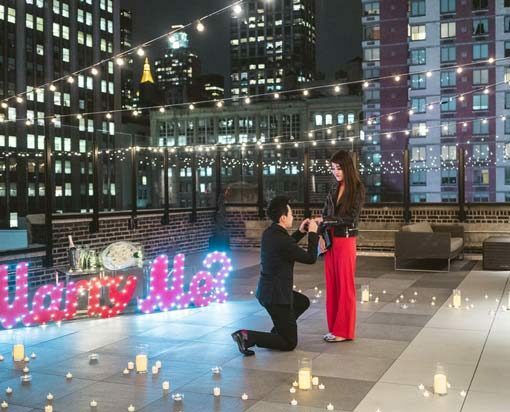 As you come upstairs your proposal planner will already decorate the rooftop with candles and string lights, you propose and then celebrate the engagement with the happy family and friends. Tell your girlfriend, that your friend invited you for a nice evening band performance. When you arrive at the location the band will be warming up and start to interact with you. They will suggest to sing you a song and that would be your love song. As they start to perform, you propose. Just imagine her surprise to realize that everything was planned just for her. We hope you find our Valentines Day proposal tips useful and if you will use it, let us know. 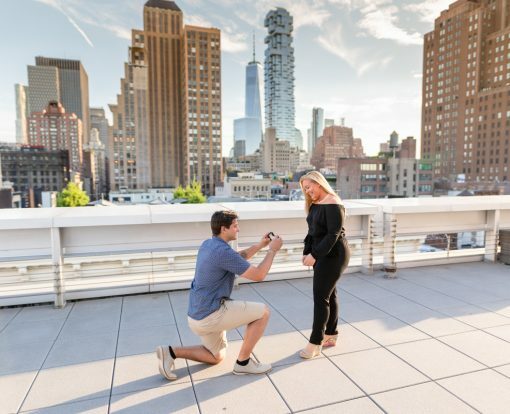 We would love to hear about your proposal experience. And the most important thing, don’t forget to hire a photographer to capture your special moment.